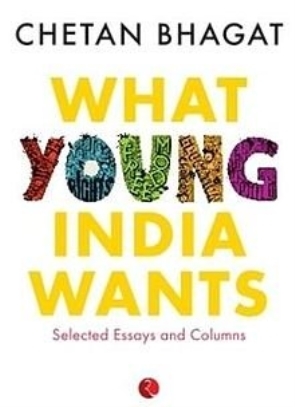 Product description: WHAT YOUNG INDIA WANTS is written by Chetan bhagat and published by Rupa publications. Buy WHAT YOUNG INDIA WANTS by Chetan bhagat from markmybook.com. An online bokstore for all kind of fiction, non fiction books and novels of English, Hindi & other Indian Languages. Cant our political parties ever work together? We love our India, but shouldnt some things be different? All of us have asked these questions at some time or the other. So does Chetan Bhagat, Indias most loved writer, in What Young India Wants, his first book of non-fiction. What Young India Wants is based on Chetan Bhagats vast experience as a very successful writer and motivational speaker. In clear, simple prose, and with great insight, he analyses some of the complex issues facing modern India, offers solutions and invites discussion on them. And, at the end, he asks this important question: Unless we are all in agreement on what it is going to take to make our country better, how will things ever change? If you want to understand contemporary India, the problems that face it, and want to be a part of the solution, What Young India Wants is the book for you.